The Body Ecology Diet was written by nutritionist Donna Gates to help people to restore and maintain the ‘inner ecology’ of the body so as to regain health and vitality. Gates does not promote her plan as a weight loss diet, but she says that it can play a major role in dealing with the health factors that may contribute to obesity. The diet is based on the concept that our bodies have a natural balance of microorganisms that are involved in a range of functions in the body. Gates says that there are many factors in our modern diets that are contributing to the disruption of that balance such as the excessive consumption of foods that are high in carbohydrates and sugar. The Body Ecology Diet rebuilds the natural ecosystem so as to support optimal health and improve a variety of chronic health conditions. This diet is basically a version of a Candida diet. This first is the addition of cultured foods to the diet such as fermented vegetables, organic yogurt and kefir, which is a fermented drink, made from either organic milk or coconut water. The second principle is to change the quality of fats in the diet. Gates encourages the use of ‘good’ fats such as flaxseed oil, extra virgin olive, and coconut oils. The third principle involves dramatically reducing carbohydrate and sugar intake. Most forms of concentrated carbohydrates are eliminated on this diet such as grains, potato, sweets, and the majority of fruits. As dieters progress on the diet they may be allowed to carefully increase their intake of fruits, high carbohydrate vegetables, and specific grains. Gates states that these three factors can have a profound effect on your level of wellbeing and vitality by improving the natural balance of the inner ecology. Gates also introduces dieters to the concept of food combining which she states is very important to improve digestive function. Kefir made from goat milk or organic cows milk, coconut water kefir, cultured vegetables such as raw sauerkraut, sea vegetables, organic eggs, fish, organic chicken, turkey, lean meat, sunflower and pumpkin seeds, salads and steamed vegetables, quinoa, amaranth grain, millet, buckwheat flour, coconut oil, olive oil. Exercise is recommended to increase oxygenation of the body and to reduce the presence of certain microorganisms such as Candida. These exercises can be used with the Body Ecology Diet. 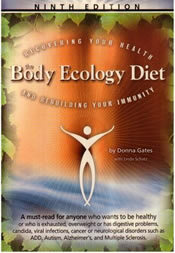 The Body Ecology Diet retails for $24.95. There are many recommended supplements that may increase the cost of following this program. There will also be an increase in the grocery bill due to the need to purchase special foods and organic produce. Provides a natural alternative yeast infection treatment and the management of digestive disorders and chronic fatigue. Includes recipes, menus, and shopping lists. Includes tips for controlling the urge to snack and for eating away from home. Does not specifically address weight management and is targeted more at improving general health. Very restrictive diet both in regards to allowed foods and diet structure. Very difficult to eat out. A great deal of time must be spent in food preparation. Diet involves food combining, which is lacking in scientific support. Recommends the use of many expensive supplements. It may take some time to experience the desired results on this plan so it will be most appropriate for those with a high degree of motivation. Even though this diet does promote food combining, which is criticized by some as lacking in scientific evidence, many dieters have found relief from digestive disorders with this approach. Although it is possible to lose weight on this program it is probably more suitable for individuals who wish to address specific health concerns, as the issue of weight loss is not the main focus of this plan. After 30 years of using a wide variety of Diets and Supplements to treat an equally wide variety of health problems – including Severe Candida, Chronic Fatigue, Hormone Imbalances, Fibromyalgia, Arthritis, Heart Palpitations, Severe Prolonged Menopause, Adrenal Fatigue, Thyroid, Skin, Brain, Nervous problems. Many/most things helped – but did not heal. – most of them helped in some way. – when they do start to help – your body shifts into a detoxification mode – which initially makes you feel worse – before you begin to feel better. – the longer you have been ill – the longer it takes your body to clean and heal itself. – the people in Natural Medicine are slowly improving their understanding of the “Modern Chronic Health Epidemic” caused by the degradation of our modern diets and increased toxicity in our lives – and continue to show improved understanding of how to correct / improve these. – this Diet addressed many of the underlying problems – but in my experience with similar diets gave me some help not healing – and did not correct underlying problems. – It may help people with mild to moderate Candida and other Chronic Health Problems – but for severe problems may not be enough. – I have found much better success with the Primal Diet – which gave me 10X the improvement in Health that this program – or any other of dozens approaches have. My health has improved steadily for 2 years (cycling continuously in and out of detox)- and I am off 90% of the supplements I was previously on without relapses of illness or deficiencies that used to occur off supplements. Fibromyalgia is now 75% better and we are saving enough on supplements that we can now afford a car loan in spite of the more costly foods. I clicked two stars but this system shows 4 stars and won’t let me change it! Unbelievable. I’ve been struggling with advanced Candida for about a year now. I finally found this book after trying so many suggested supplements that did nothing so I continued with my search for answers. I haven’t really seen much of an improvement, and yes, the diet is extremely restrictive. I am very thin already and I’m now feeling like I’m starving to death because my body isn’t reacting well to what I’m eating, I seem to be getting gas all the time now and it’s killing me. Plus, Donna continuously promotes her very expensive products throughout the book, which I find frustrating. I’ve purchased a couple and they haven’t made any difference, perhaps even made me worse. I could not control my weight, I was tired all the time, had no energy, kept having yeast infections, and ached all over. I tried everything to lose weight, for at least two years, including very restrictive diets and exercising every day. Within 3 days of starting on the body ecology diet, pounds started to melt. All the cultured foods tasted “good” as though my body needed them. After 2 weeks I have more energy and the aches and chronic yeast infection have begun to back off. I’m sold!